Hedrick Smith Who Stole the American Dream? Pulitzer Prize-winner Hedrick Smith’s new book is an extraordinary achievement, an eye-opening account of how, over the past four decades, we have become two Americas. In his bestselling The Russians, Smith took millions of readers inside the Soviet Union. In The Power Game, he took us inside Washington’s corridors of power. Now, in Who Stole The American Dream?, Smith takes us across America to show how seismic changes, sparked by a sequence of landmark political and economic decisions, have transformed America. As only a veteran reporter can, Smith fits the puzzle together, starting with Lewis Powell’s provocative memo that triggered a political rebellion that dramatically altered the landscape of power in Washington from then until today. 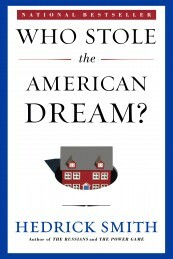 This is a book full of surprises and revelations—the accidental beginnings of the 401(k) plan, with disastrous economic consequences for many; the major policy changes that began under Jimmy Carter; how the New Economy disrupted America’s engine of shared prosperity, the “virtuous circle” of growth; and how America lost the title of “Land of Opportunity.” Smith documents the transfer of $6 trillion in middle-class wealth from home- owners to banks even before the housing boom went bust, and how the U.S. policy tilt favoring the rich is stunting America’s economic growth.